On the 30th (Tue), take in the spiritual surroundings of Gurudwara Bir Baba Budha Sahib and then contemplate in the serene atmosphere at Tarn Taran Sahib. Here are some ideas for day two: relax and rejuvenate at some of the best spas, then take in the spiritual surroundings of Mandir Mata Lal Devi, then take in the spiritual surroundings of Durgiana Temple, and finally take in the spiritual surroundings of Dukh Bhanjani Ber Tree. 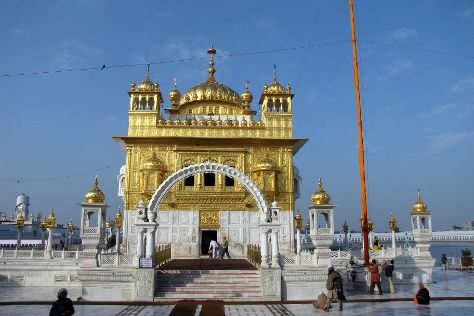 For photos, more things to do, and more tourist information, use the Amritsar vacation planner. Mumbai to Amritsar is an approximately 4.5-hour flight. You can also drive; or take a train. Traveling from Mumbai in April, you can expect nighttime temperatures to be little chillier in Amritsar, with lows of 19°C. Cap off your sightseeing on the 1st (Wed) early enough to go by car to Dalhousie. Khajjiar Lake has been added to your itinerary. On the 2nd (Thu), explore the activities along Khajjiar Lake, then take in the awesome beauty at Dainkund Peak, and then identify plant and animal life at Kalatop Wildlife Sanctuary. Get ready for a full day of sightseeing on the next day: take in the architecture and atmosphere at St. John's Church, then steep yourself in history at Subhash Baoli, then explore the activities along Chamera Lake, and finally take in nature's colorful creations at Rock Garden. To see photos, where to stay, traveler tips, and more tourist information, use the Dalhousie road trip planning site . You can drive from Amritsar to Dalhousie in 3.5 hours. Other options are to do a combination of train and bus; or do a combination of train and taxi. Wrap up your sightseeing on the 3rd (Fri) early enough to drive to Dharamsala. Start off your visit on the 4th (Sat): soothe aching muscles at some of the top local wellness centers, take in the spiritual surroundings of Dalai Lama Temple Complex, and then take your sightseeing to a higher altitude at Triund Hill. For traveler tips, other places to visit, and other tourist information, go to the Dharamsala route planner. Drive from Dalhousie to Dharamsala in 2.5 hours. Finish your sightseeing early on the 4th (Sat) to allow enough time to drive to Manali. Do some cultural sightseeing at Hidimba Devi Temple and Naggar Castle. Get outdoors at Solang Valley and Keylong. Pack the 7th (Tue) with family-friendly diversions at Manali Picnic Spot and Camps. There's still lots to do: indulge in some personalized pampering at some of the best spas, see the interesting displays at International Roerich Memorial Trust, take in the natural beauty of Vashisht Baths, and contemplate in the serene atmosphere at Siyali Mahadev Temple. Inspirock's itinerary builder makes planning a Manali trip simple and quick. Getting from Dharamsala to Manali by car takes about 5 hours. Other options: take a bus. Finish your sightseeing early on the 8th (Wed) to allow enough time to drive to Chandigarh. 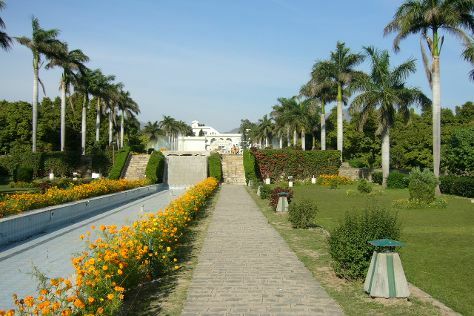 Start off your visit on the 8th (Wed): take in the spiritual surroundings of Kansa Devi Temple, then explore the activities along Sukhna Lake, then don't miss a visit to Gurudwara Nada Sahib, and finally admire the natural beauty at Pinjore Gardens. To find more things to do, traveler tips, maps, and tourist information, you can read our Chandigarh online trip builder . You can drive from Manali to Chandigarh in 5 hours. Alternatively, you can take a bus. Wrap up your sightseeing by early afternoon on the 9th (Thu) to allow enough time to travel back home.